"It's hard to believe that it has already been ten years since we took this picture of Bob and Tony posing in front of their new Americana Model fifthwheels (triple axles no longer available). We have been doing this for a long time! We either love what we do, or we're too old to retrain." what a great deal they got. Bob Renberg and Tony and Nancy Sheehan decided that rather than waiting for their new Americana models to come to them, they would go to their new Americana models. So Bob flew out from Leavenworth, Washington, and Tony and Nancy unstuck themselves from Lodi, California and met Russ in Indiana. Not only were they able to save alot of money on freight, but they had the opportunity to really try out all systems to make sure they worked correctly. Not to mention that they got to meet Russ (what a treat). Picking the unit up in Indiana meant that they were close at hand for parts and service just in case we missed something during our final check-out.Even though we are always trying to defeat Murphy (the guy with the law), sometimes he gets the better of us. An Indiana delivery means we can fix any problems that might arise right there on the spot. Bob and his wife, Ruth, operate a boy's ranch in Washington. Visit testimonials to read about Bob and Ruth's maiden voyage. 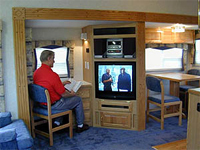 Tony and Nancy are still working to get their truck and fifth wheel paid for before they retire in a few years. They go gold prospecting as a hobby with their 4x4. The 4x4 ready Americana model with it's big 16 inch tires and fantastic ground clearance meets their requirements for off road, very tough desert and mountain use. We made it home Monday at about 10 p.m. The trailer pulled great. Just wanted to let you know how happy we are with the whole buying experience, and the quality of the product. We also would like to thank you again for the good time and good Amish food that we shared together. Since getting home we have been busy outfitting the trailer for our first full out camping trip. We are sure we will enjoy this trailer for many years to come. Bob Reneberg sitting in his new entertainment center.